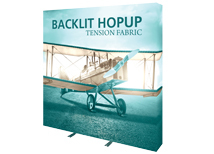 Backlit Hop Up displays are a great alternative to standard pop up display kits. It uses the same components as our standard Hop Up, but incorporates LED back lighting and a block out liner to create a pop up that will stand out. These are harder to assemble than our standard Hop Up because of the additional components, but can still be assembled is less than 30 minutes! Every kit includes a hard shipping case to safely transport every component. Turnaround time is only 3 business days and we can ship from either IL or NV! 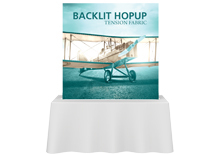 Backlit Hop Ups offer a unique look that was once only available from custom manufactures and a very high price. The Hop Up integrated with back lighting now offers a low cost, fast turnaround option that is unmatched by any other backlit system. The Hop Up uses a block out liner and LED light bars in every quadrant to create even and consistent lighting. 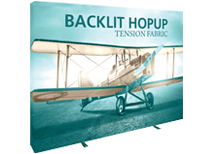 Currently the backlit Hop Up is only available in a straight model in the table top, 8 foot, and 10 foot sizes. Specs and set up instructions can be found on the product detail pages. We also offer the Orbus Hop Up Counter which is a great addition to any of our Hop Up displays!